The letters threatened scandal ... to out Miss Irene Walsford's fiancé's wild parties and other women. Dixon Hawke glanced at the photographic prints which Tommy Burke had just placed on his desk. The prints were enlargements of snapshots which Tommy had been assiduously collecting since he had acquired a new camera some weeks before. The enlargements were also his own work; he had fitted up a homemade apparatus in Hawke’s laboratory. “H’m, not bad for an amateur,” and bent his head to hide the twinkle in his eye. Tommy opened his mouth indignantly. “An amateur —” he began, but the shrill ringing of the doorbell interrupted him. Tommy glanced quickly at his master. It was late Saturday forenoon, and they had just completed their business of the week; no callers were expected. As the housekeeper was out, Tommy hurried to the door and ushered in a young lady, who introduced herself to the detectives as Miss Irene Walsford. Miss Walsford was a tall blonde, with delicate features and wide blue eyes. Hawke had risen to meet his visitor, and his practised eye noted that she was suffering from great mental agitation. He at once set about putting her at her ease. Fumbling in her handbag, Miss Walsford handed the detective five letters. As he scanned the letters Hawke’s brows contracted into a frown. He was amazed and disgusted at the temerity of the unknown writer. The letters were addressed to Miss Walsford, and purported to give her information of the supposed nefarious conduct of her fiancé, Ralph Litteton. Mention was freely made of “another woman,” together with reports of drunken orgies at obscure night clubs. Dixon Hawke threw the letters on the desk with a gesture of distaste, and turned to his troubled client. The girl looked up, startled. Dixon Hawke picked up the letters and the envelopes. Hawke noted the sequence on the envelopes and continued with some routine questions. Miss Walsford was unable to supply any further information, and a few minutes later she left the criminologist’s rooms. When the door had closed, a transformed Hawke turned back to the desk and Tommy sprang to do his bidding as Hawke handed him the letters. The young assistant was not long in carrying out the order, and, leaving the damp prints to dry, Tommy hurried into the office, to find Dixon Hawke studying a map of England and a Post Office Guide. Hawke looked up as his assistant entered. Litteton & Company were wine importers. Although Ralph Litteton was a director of several businesses, his main interest was in the offices at which the two detectives called. Proffering his card to the girl who inquired his business, Dixon Hawke and his assistant were ushered into the inner office. Ralph Litteton greeted Hawke affably. Dixon Hawke laughed and briefly explained to Litteton that he was on the track of a man or men whom he believed had been employed by the wine importer. When Dixon Hawke had explained his business to the warehouse foreman, Brown looked doubtful. “Well, there’s been two men sacked here recently, Mr. Hawke,” he said. While the man was talking they had been walking through the warehouse. At this moment they were passing through a room where three clerks were working at a long desk, and Brown was interrupted by a cry from the outside. Instantly one of the clerks left his desk and crossed the room to where a narrow conveyor belt emerged from the left wall, and terminated in a large tray. Below the tray a larger belt continued across the room, disappearing through the right wall. Seating himself on a stool, the clerk pulled over a switch, and the belts whirred into motion. Long-necked bottles appeared on the narrow belt, and began piling up on the tray. Waiting until a number had gathered, the clerk pulled a small lever, and the tray tilted, depositing the bottles on the lower belt, where they were whisked out of sight. At the same time the clerk made a note on a paper by his side. The two visitors watched the operation with interest. “Quite an ingenious idea,” Dixon Hawke commented. Hawke watched the clerk closely. Continuing the conversation, Dixon Hawke was gratified to learn that Brown could give him particulars of the whereabouts of the two men. Oxenam, it appeared, had learned to drive a car, and was working as a lorry driver between London and the Midlands, whilst Meazer had a position with a firm of wholesale manufacturers. After a short tour of the warehouse the two detectives bade good-bye to Brown. Leaving the warehouse, they made their way to the addresses which the foreman had given them, and confirmed the information about Oxenam, at the same time eliciting the fact that Meazer was employed as a commercial traveller, working a Midlands district. Dixon Hawke looked thoughtful as he returned to the office. Taking the dry prints from Tommy, he studied them carefully. For some ten minutes he concentrated his attention upon the enlarged writing, and Tommy Burke, watching closely, strove to follow his master’s line of thought. The writing in each of the letters was identical. It was slow, laboured writing, sprawling all over the page, and had evidently been the subject of much concentration on the part of the writer. It resembled the painful efforts of a child. Suddenly Hawke looked up. Tommy Burke looked surprised, and Hawke smiled. An hour later Dixon Hawke and his assistant were entrained and speeding towards Sheffield. On the rack above their heads reposed a leather bag containing samples of Simpson’s manufactures, and from Hawke’s pocket protruded a blue order book. In Sheffield Dixon Hawke hailed a taxi. To the driver he explained that he and Tommy were commercial travellers new to the district, and asked the driver to take them to some good hotel where they might meet some fellow-travellers. After they had arrived there and Hawke had signed the register as Mr. Robertson, he engaged the clerk in conversation. When the clerk mentioned the name, Tommy Burke’s eyes instantly dropped to the register. A few names above their own, the name “Meazer” was inscribed. Tommy was bitterly disappointed; the writing was in no way comparable to that of the letters. Once again Tommy found himself stumped, and the clerk was speaking again. Tommy Burke needed no prompting. He followed their man into the dining-room and took a table some distance from the corner where the man was seating himself. Completing his arrangements at the desk, Dixon Hawke joined his assistant, and they observed Meazer order tea. “That’s our man, Tommy,” Hawke whispered. Tommy accepted the information without question. Dixon Hawke pursed his lips. After tea Tommy Burke followed Meazer closely, but two hours passed before he observed any suspicious move. Meazer wandered around the hotel, read a paper, spoke to a few men, and generally behaved in the manner of a man idling away his time. Suddenly, as if the idea had occurred to him or he had come to a decision, he made his way to the writing-room. As this was late Saturday afternoon the writing-room was empty. Meazer made his way to one of the writing-tables. Taking a piece of paper from his pocket, he picked up a pen and began to write. Tommy Burke, watching from the doorway, gave a gasp of excitement. Meazer was writing with his left hand. From the awkward manner in which the pen was held, it was easy to see that this was not the writer’s normal position. Tommy carried out the instructions carefully. As the lad stumbled against him, Meazer instantly covered his work and cursed the apologising Tommy profusely. Picking up some sheets of writing-paper, Tommy renewed his apologies and hurried from the room. Dixon Hawke nodded approval at his assistant’s information. Meazer watched Tommy’s exit suspiciously, and, muttering to himself, turned once more to his letter. For a few minutes he considered what he had written, then bent to his task. Then a hand like a steel vice suddenly seized his wrist. “Quite a pleasant after-dinner recreation, Mr. Meazer,” Hawke said. Dixon Hawke ignored the question and glanced at the letter on the table. The scandalous contents of the latest epistle were enough to prove beyond all shadow of doubt that Meazer was responsible for the poison-pen letters. In his office that Saturday night was enacted a little drama which gave Dixon Hawke great satisfaction. Miss Walsford had just arrived, summoned by an urgent telephone message, and with her came her fiancé, Mr. Ralph Litteton. Hawke smiled as he motioned him to a seat. Litteton took a seat beside his fiancée. As he did so he became aware of a man seated in a corner of the room. With a start Litteton jumped to his feet, but Hawke intervened. Meazer rose from his chair and addressed the girl. In halting sentences the man told how he had been employed by Litteton, and had been dismissed for pilfering. The dismissal had rankled in his mind until the announcement of his ex-employer’s engagement had given him the opportunity for revenge, and he had attempted to wound Litteton through the girl. He ended with an abrupt apology. During this time Miss Walsford made no remark. 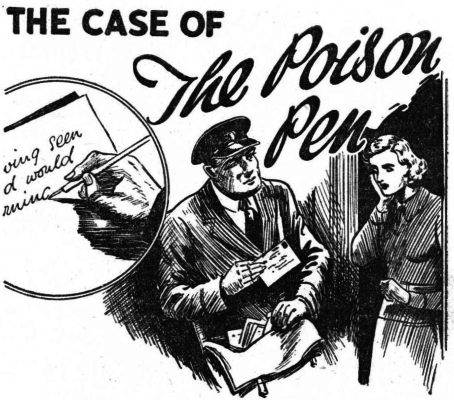 It was obvious that the interview was as painful to her as it was to the wielder of the “poison pen.” When the man had finished Dixon Hawke stepped across to the door and pulled it open. On the threshold stood a man with a notebook in his hand. “Every word,” the man replied, and slipped handcuffs on Meazer, whom he led away. When the police officer had gone with his prisoner, Hawke turned to Miss Walsford. Alone with Tommy Burke after his clients had gone, Dixon Hawke turned to his assistant. Seating himself at his desk, Dixon Hawke arranged the letters and photographic prints before him, while Tommy watched his chief closely. “You see,” Hawke began, “in the first place, the writing is laboured, which offers the obvious explanation that the writer was illiterate. If you will study the letters closely, however, you will see that they are balanced and written in good English. You will also observe certain characteristics —a certain flourish which denotes the practised writer. Now, when I write with my right hand there is a flourish to my writing which is the outcome of years of constant use of the pen; when I take the pen in my left hand I not unnaturally attempt to write my normal style. This is a mistake, as my left hand must be trained from simple forms, as has been my right. “One other point. All normal people form the letter ‘o’ anti-clockwise. In these letters the word ‘ on ‘ occurs frequently, and friend Meazer in the first of the letters has formed the ‘o’ clockwise, which is easier with the left hand, but towards the end he has reverted to his normal style.